ObamaCare employer mandate delayed, start of train wreck? Scheduled to take effect on January 1, the employer mandate portion of the Affordable Care Act (ObamaCare) has been delayed for one year. Will the implementation of other parts of ObamaCare be delayed? I think it seems likely. But: Section 1513 AVC states, regarding the employer mandate: “The amendments made by this section shall apply to months beginning after December 31, 2013.” So does the administration have the legal authority to make changes like this? 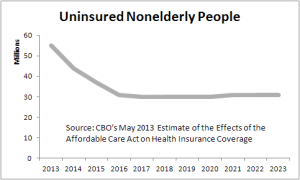 Also: For all the wrenching debate and changes, there will still be many uninsured people. 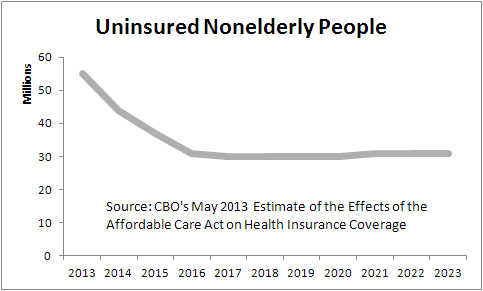 Here’s a chart based on the Congressional Budget Office May 2013 estimate of the effects of the Affordable Care Act on health insurance coverage. The employer mandate actually consists of two different penalties, based on two different categories of employer behavior. 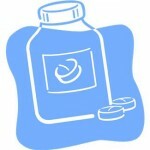 These originate from Section 4980H of the Affordable Care Act. Subsection (a) requires steep penalties for employers who offer no coverage at all. Subection (b) requires modest penalties for employers who offer “minimum essential coverage under an eligible employer-sponsored plan.” This difference — between the strong penalty in 4980H(a) and the weak penalty in 4980H(b) — is crucial to understanding how things will play out in the future. Under the strong penalty, in which an employer “fails to offer to its full-time employees…the opportunity to enroll in minimum essential coverage,” and “at least one full-time employee” enrolls in an exchange, the employer has to pay a fine of $2,000 times the total number of full-time-equivalent employees at the firm, minus 30. (The employer mandate only applies to firms with 50 or more full-time-equivalent workers.) So if you employ 50 workers, that’s a fine of 20 * $2,000 = $40,000. And the fine isn’t tax-deductible, adding to the pain. Roy goes on to explain that “minimum essential coverage” means coverage my any insurance plan that can legally be sod in a state, including plans that provide limited coverage or services. Roy writes that companies may offer these bare-bones plans to their employees and escape the penalties. Economic incentives are what makes the world work. They’re based on human behavior, and that isn’t easily changed, even to suit Barack Obama’s desires.